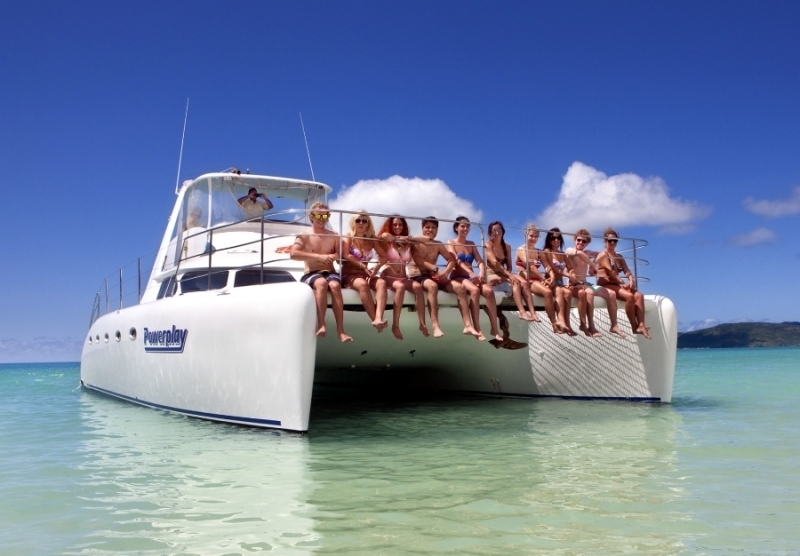 Plan your perfect trip in the Whitsundays on one of its funnest tours! 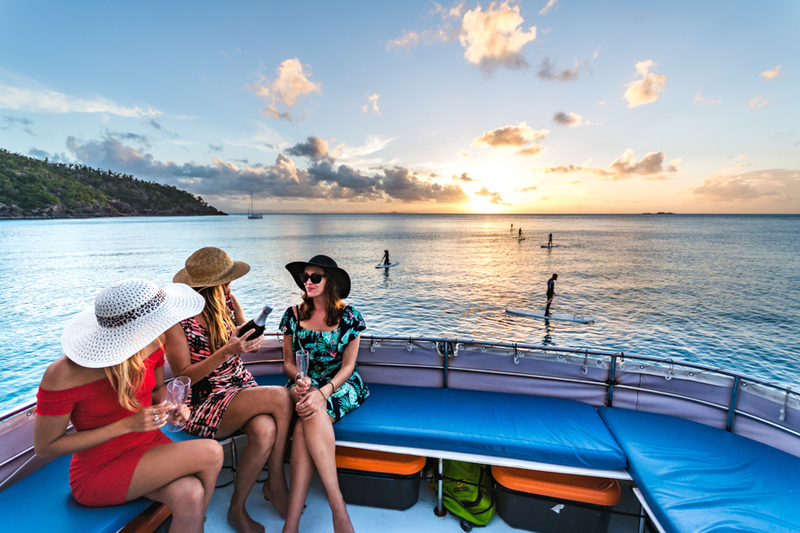 Powerplay Private Charter is the perfect trip for making lifelong memories, with a once-in-a-lifetime fully exclusive experience though the Whitsundays. Enjoy your trip the way you want, soaking in the sun, spending time at Whitehaven or snorkelling in some of the most beautiful reefs in the world. Keep an eye our for stingrays and baby lemon sharks as you enjoy the sights of Hill Inlet Lookout, or lay back and relax as Powerplay cruises from place to place - it's your trip to do what you want! During your private charter, you can help plan the itinerary alongside your crew, who will let you go at your own pace and help you pick out the best places to visit during your 2 days and nights at sea. Powerplay takes out a total of 18 passengers and 3 crew, making it a great place to bring all your closest family or friends for a fun and relaxing tropical escape. 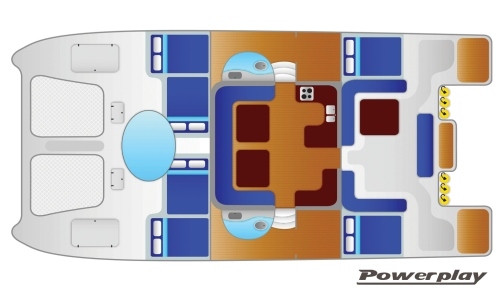 Unlike most boats in the region, Powerplay features a 3 tiered design which allows for optimal space and comfort! Powerplay will guide you to one of the most stunning places in the world, Whitehaven Beach. Famous for its silica sand beaches that stretch for seven uninterrupted kilometers, Whitehaven is unlike anything you've ever seen. You can bask in the sun, walk among the stingrays, or swim in the clear blue waters. Whitehaven has stunning views of its neighbouring islands as well as a beautiful and unique landscape that is a photographers dream. Your host will take you on a guided bushwalk on Whitsunday Island where you will be able to witness the famed swirling sands of Hill Inlet. These swirling sands create a masterpiece of aqua, azure, topaz and white as the colours of the ocean and silica sands blend together for a truly magical experience. Your crew will take you to several different snorkel locations where you will have the opportunity to explore the inner fringing reefs of the Great Barrier Reef Marine Park. Your crew will tell you about the reefs you visit and what to keep an eye out for - each reef is unique and home to an array of amazing marine life. Powerplay had hosts double inflatable kayaks and paddleboards so guests can enjoy the reef in an entirely new way! Paddle around the beautiful fringing reefs of the Great Barrier Reef and enjoy this unique view of the islands, reefs and coves of the Whitsundays. Definitely one of Powerplay's best assets, the heated spa is a popular feature among all passengers. It's perfect for warming up after your water activities, or for enjoying an evening beverage while lounging and star-gazing! If you're looking for an equally relaxing but dry alternative, opt for the trampoline nets at the front of the boat. Blue lights are amazing for attracting marine life and make for the perfect show at the end of the day. The underwater blue light entertainment starts after the sun goes down, where you'll have the chance to see giant trevallies, bait fish, squid and even dolphins that come to see what the light is all about! This unique feature is an amazing way to see elusive marine life to enjoy a show unlike any other. All meals are freshly prepared on board by your friendly host and include a BBQ dinner both nights! Marinated chicken, fresh salads, deli meats, juicy steaks, tropical fruits - you will be well fed so you're ready to tackle all the amazing adventures you will have! We are able to cater to most dietary requirements upon request, please just let us know upon booking. Breakfast now includes bacon and eggs, pancakes and waffles! There is fresh fruit available to eat on board at all times. This is a sample of menu and is subject to change and amendments. As Powerplay is very water-orientated, you MUST be able to swim to board the boat, and for safety reasons, you must also be able to speak English. If you do not fit these requirements, you may not be able to book this tour. Please bring only a small soft bag with: change of clothes, hat, swim-wear, beach towel, sunscreen 30+, warm pullover for the evenings (seasonal). You will also need to bring your own alcoholic beverages, available for purchase in town. No glass bottles please. All cancellations will incur a 25% cancellation fee. Cancellations made within 30 days of travel will result in a 100% cancellation fee. If the sailing company has to cancel the trip (prior to the boat's departure) and we cannot offer a suitable alternative, then a refund will be given minus card fees. We strongly recommend that you have travel insurance, especially during the wet season. Please note if the balance is not paid on time the booking is cancelled and deposit you have paid forfeited.